Inspired by a recipe in The Best of Country Cookies: A Cookie Jarful of the Country’s Best Family Favorites, Selected from over 34,000 Shared by Subscribers in Taste of Home’s “Cookie of All Cookies , these blueberry oatmeal cookies are loaded with cinnamon and brown sugar flavor. They’re like eating a blueberry cobbler in the form of a soft and chewy cookie with crisp edges. For the blueberries, I used fresh ones which I’d frozen the day before. Freezing the fresh blueberries makes the cookies a lot less likely to turn blue, as does tossing the berries in flour and keeping them frozen until the last minute. Brown sugar and cinnamon rich oatmeal blueberry cookies. Remove 1 teaspoon of flour from the 1 cup measure and set aside. Mix the remaining flour, cinnamon, salt, baking soda and baking powder together in a bowl; set aside. Carefully shape into balls (mine were a little over an inch) and space about 2 ½ inches apart on the parchment lined cookie sheets. Bake at 350 degrees for 12-15 minutes (check at 10). Let cool on cookie sheets for about 3 minutes, then transfer to a wire rack to cool. Yum! Add 1/4 cup of white chocolate chips to this recipe! Yes, tricky scooping toward the end b/c berries are thawing out. You can’t scoop as you cook, as I would with regular cookies. You need to scoop out all the dough at once as fast as you can onto pre-torn (if you will) pieces of parchment. Then place the pieces of parchment onto the cookie sheet as you cook. Love these cookies and love the website!!!! I’ve never made these as bars but it sounds like a good idea. Have you tried this recipe as a cookie bar or heard from anyone who has? I love this idea of fresh blueberries as opposed to dried, but want to be sure I wouldn’t end up with too much contained moisture in such a mass of dough. I would like to an 8×8. Thanks for trying the, Sue! Very good cookie! Not too sweet. It was tricky scooping them towards the end because the berries were thawing out. Made about 4 doz. So so so good!!!! I made these cookies for breakfast this morning for myself and my 6 children. My VERY picky 10 year old proclaimed, “I don’t like oatmeal so I’m not going to like these.” After being told to try one she ever so carefully proceeded. “Mom, after I finish this cookie, may I have another?” she asked. I can’t believe it!!! This child never gives in so easily. Thanks for the delicious recipe; we all love it. I’d really appreciate the help! This recipe is one my favorites. I don’t use walnuts typically because I’m unsure whether people like them or not and they are delicious without! I’m sad blueberry season is coming to a close. Next year, more will be made! Thanks for adding a review, Karine! I appreciate it. I made these and found them to be absolutely wonderful. It’s crucial to freeze the blueberries, which I did. Otherwise, I can see how they would turn your cookies into a blue mess. I also used whole wheat flour and pecans (instead of walnuts). We love them. Sorry your batch didn’t turn out, Cassie. This is the WORST cookie recipe ever! Unless you flatten out the dough, it will look like a bear ate blueberries and pooped on the cookie sheet. It says you can use fresh or frozen but if you use fresh then they just get mashed up and the dough turns purple. I would not recommend trying this. Oooo my dad loves blueberry crisp, maybe I’ll whip some of these up for father’s day. He really likes apple crisp too…hmm…think I can subsitute the blueberries for chopped apple pieces? Let me know!! These are sooo good….and easy! Thanks for sharing! That’s great! I hope your guests like the cookies too. I just tried making these. They turned out SO delicious, thanks for the recipe! I froze my blueberries also, and it actually helped me drop the balls of dough onto the cookie sheet since it got cold and less sticky when I threw them into the cookie mix. I hope I don’t eat all of them before my guests come over. Thanks for the walnut tip, and glad you liked the cookies. I’ll have to try them with the browned butter icing. I’ve had my eye on Paula’s recipe for a long time, but I think the buttermilk might make them a little too cakey for my taste. I’m not sure and I *do* plan on trying them one day. I was getting ready to make Paula Deen’s Ultimate Oatmeal Cookies when I started reading the reviews on them. Although they got great reviews overall, a lot of people really disliked them. I then came to your site and the recipe of the day was for oatmeal cookies so I took that as a sign. I made them this afternoon. Since I really liked the idea of Paula’s Browned butter icing, I drizzled that on top. WOW! Talk about delish! You mentioned that they reminded you of cobbler so imagine how they taste with a butter icing on top. And very pretty to boot. BTW, you forgot to list the walnuts in your directions. Thanks again for the recipe. I can’t wait to try these cookies! I love a soft and chewy cookie. Lately, I’ve been buying a container of blueberries every time I go to the store. We have a local store that has them on sale for $1.99 and they’re excellent blueberries. With the whole wheat flour, oatmeal, and blueberry combination, they sound like they would even be good for breakfast! Any idea of the nutritional info on these? I toast nuts in the microwave all the time. They’re not as evenly toasted as when you use the oven, but when you’re only dealing with a handful of nuts, the microwave is very efficient. What I do is scatter them on a paper towel and microwave them for 2 to 2 minutes and 30 seconds. Pecans take a little longer than walnuts. Halfway through, I shuffle them around a little. This is a big time saver and much better than just skipping the toasting process. These look great! You can toast nuts in the microwave?? Who knew? Love that tip! They look delicious- I’ve never had blueberries in oatmeal cookies before, but would love to try them! Katrina, mine have been hit or miss too. However, at the prices we’re paying I can’t be too picky. It’s just good to have them fresh. Jen, let me know what you think. Louise, I am sorry but that made me laugh ;). Beth, thanks for pointing out the mention. I’ll have to find a copy to send to my relatives. I always enjoyed reading blurbs and about other contestants…probably to the point where I scared them by pointing out things all the things I knew about them from blurbs and spotlights. 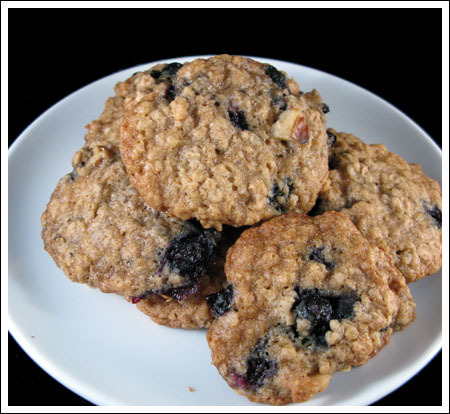 Angie, did you see my old Eating Well recipe for blueberry white chocolate ginger cookies? I won a prize a while back for that combo. In my opinion, this one is better because the blueberries are fresh and (like I said above) juicy and burst-open. But yes, I think white chocolate and ginger would be good here if you had it on hand. Oh these look so good! I love it when cookies combine flavors- I wonder if you could add white chips and/or candied ginger to these?? On that note…does candied ginger even bake well? This isn’t about the cookies although this Jersey girl loves anything blueberry. I had a chance to glance through the new Pillsbury Bake Off Cookbook while I was waiting for my daughter during her storyhour at our local library. I looked for your winning recipe, and was pleasantly surprised to see the “spotlight” about you. I hope a lot of people will do a search and find your blog as a result of reading the cookbook. It would have been nice if they mentioned the name of your blog too. I really liked how they gave the reader a glimpse into the lives of the winners. What a great tribute to you and the other bakers. Wow…good timing! I’ve been searching today for something different to do with some blueberries I picked up. Never used fresh blueberries in a cookie. I’m going to freeze my blueberries tonight so I can try these. Seems like the blueberries in the stores here haven’t been that great. I missed them at the farmer’s market this week. Sigh. The cookies do look great.